Cut the ends off each spaghetti squash and discard. Slice the rest of the spaghetti squash into 1-inch rings. Use a spoon to remove the seeds from the center of each ring. Spray or rub coconut oil over all of the spaghetti squash flesh. Generously season each ring with salt and pepper. Place the rings on the parchment paper lined baking sheet and roast in the preheated oven for 30 minutes. Flip each of the rings and roast for another 30 minutes, or until very tender. Combine the dressing ingredients in a food processor and pulse until well combined. 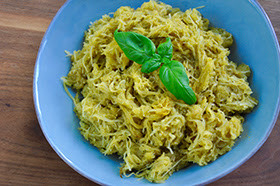 Pour the dressing over the spaghetti squash noodles and mix until fully incorporated. Serve immediately. Enjoy! Next StoryWhy Did You Do That?